The inertial behaviour of a diaphragm having a mass Σ(mi) is idealised by a ring of equivalent inertial massdistribution. 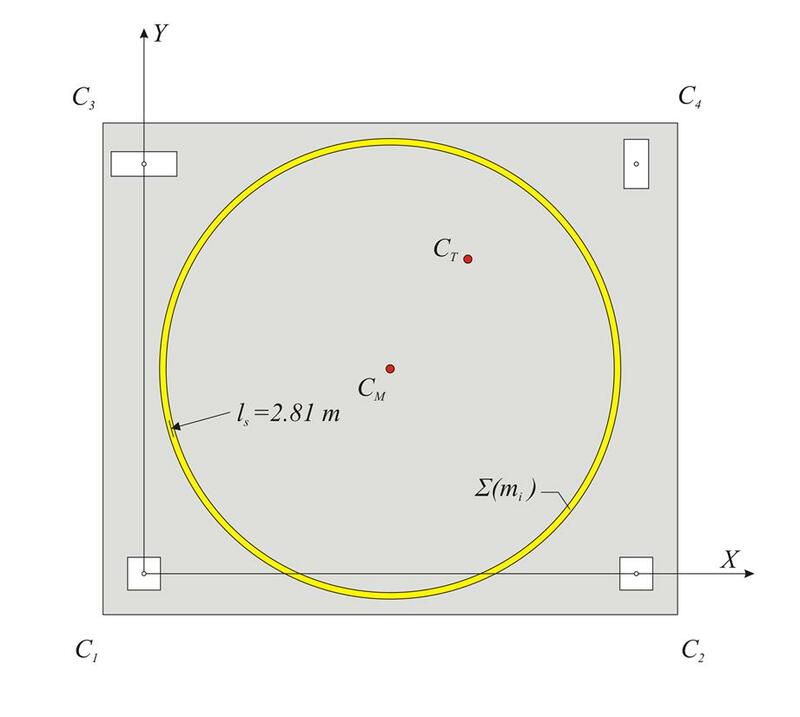 The ring has a total mass Σ(mi), its centre is theCentre of Mass CM and its radius theRadius of Gyration ls. where Χi and Υi are the coordinates of each mass point mi of the diaphragm, whereas Ipi is the polar moment of inertia of each mass mi with respect to the centre of mass CM. For a surface distributed mass in a triangular shape or a circular segment: the equivalent principal moment of inertia in respect to the centre of mass of this segment is calculated and the Steiner term m·L2 is added. where Lx, Ly are the dimensions of the floor plan. Due to symmetrical mass distribution, [*] NoteColumn self-weight is accounted for assuming that one-third of the load is applied to the top diaphragm and the remaining two-thirds to the base. The loads (and the corresponding masses) on the column tops are G1=4.0 kN, G2=4.0 kN, G3=6.0 kN and G4=4.5 kN, consequently there is a minimal deviation from the CM, i.e. with no practical difference from the geometrical centroid. Minimal differences also result, in case the small variations of the loads (masses) along the brick walls due to variation of column dimensions, as well as the extension of the slabs (designed in this way for supervisory purposes) are taken into account. XCM=3.0 m and YCM=2.5 m.
Columns: m6=0.1 ·(4.00+4.00+6.0+4.5)=1.85 t, L6=√ (3.02+2.52)=3.905 m → Ip6=1.85 ·3.9052=28.2 t·m2.